The area was lovely and the apartment was close to the beach - but all the properties in the area are and there are definitely better places to stay. I would not reccomend this place. Raki welcome shot, the owner and staff are very helpful (&cute dog - Cookies), great view from the balcony. both the room and bathroom were modern. no noise was heard at all from the main street or people in other rooms. The owner meet us when we arrived offered us a nice welcome drink before going to our room, really nice owner and property. Close to all ameneties both Platanias and Agia Marina have to offer, and a stroll across the road to the beach. 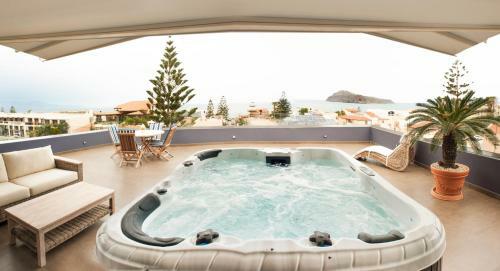 Awesome view from the junior suite with a big jacuzzi on the spacious terrace. Hotel is located near the main street of Platanias, but still peaceful and private. The room is nicely decorated and quite new. The owners were very friendly and helpful. We also got a chance to access other hotel's carpark next to our accomodation. Fantastic terrace with private jacuzzi and view. 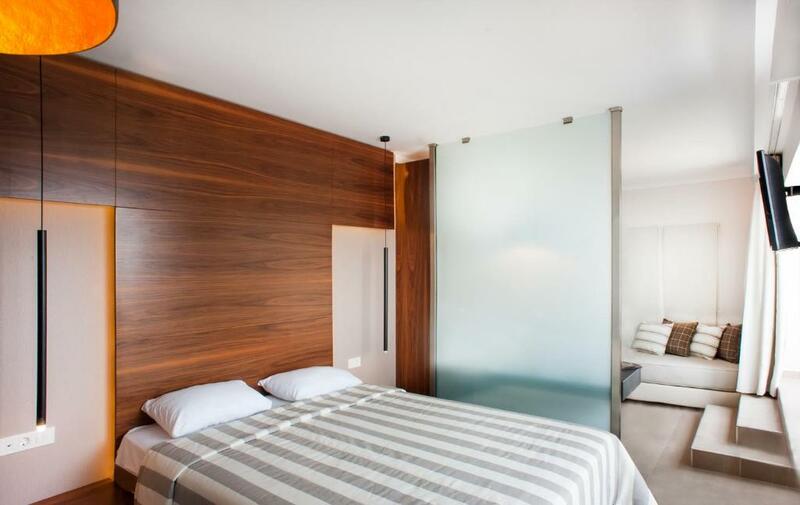 Bedroom lovely with sliding door to terrace. Living area very small, looked bigger in the pictures. Spacious bathroom. Cleaned every day with new towels and sheets too. A filter coffee machine was found to be in the room! The location of this property is perfect, situated just facing the sea and the host Georges is extremely helpful and friendly! 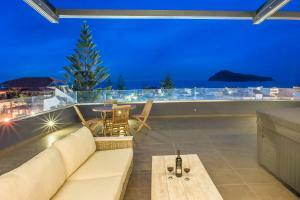 Near the sea and very close to the centre of Platanias where the bars and restaurants are. Great location/ accomodation with a feel like home, friendly environment. Care provided by all staff aswell as attention to wellfare of hosts. Lock in a great price for Frideriki Studios & Apartments – rated 8.9 by recent guests! One of our best sellers in Platanias! Surrounded by trees, plants and flowers, Frideriki Studios & Apartments lies in the heart of Platanias, the ‘tourist capital’ of Chania, just 350 feet from the beautiful sandy beach. Free WiFi is available in all areas. 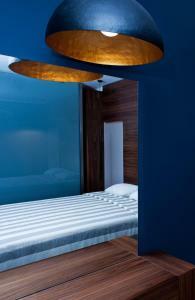 This small, family-run hotel offers well-equipped and spacious rooms, studios and apartments. 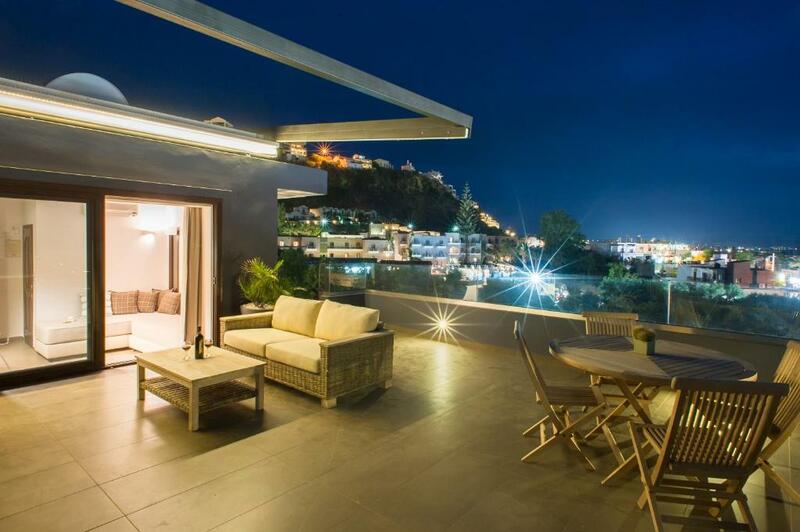 Each studio is open plan with a kitchenette and either a balcony or terrace with sea or village views. WiFi access is available in some units. 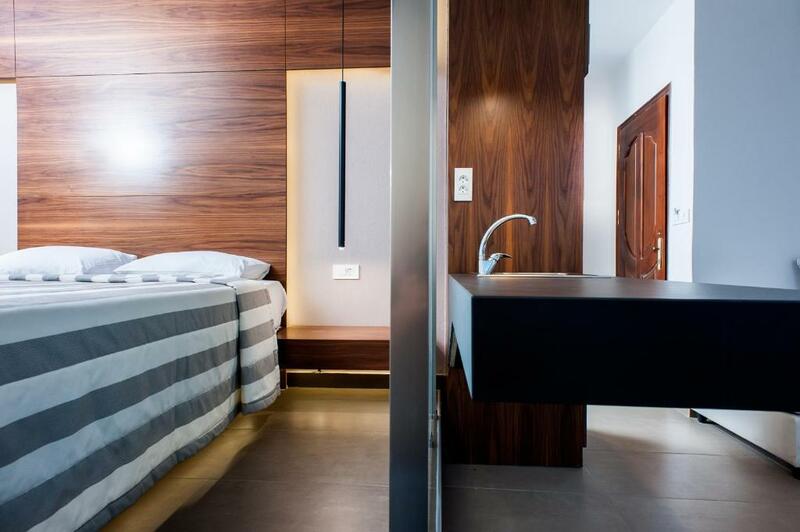 Frideriki Studios & Apartments is conveniently located only 6.8 mi from the city of Chania, 12 mi from the airport and 9.9 mi from the port of Souda. Water sports, café, bars, restaurants and lively nightlife are within easy reach. From here you can also take day trips to several other well known beaches, like Falassarna and Elafonisos. 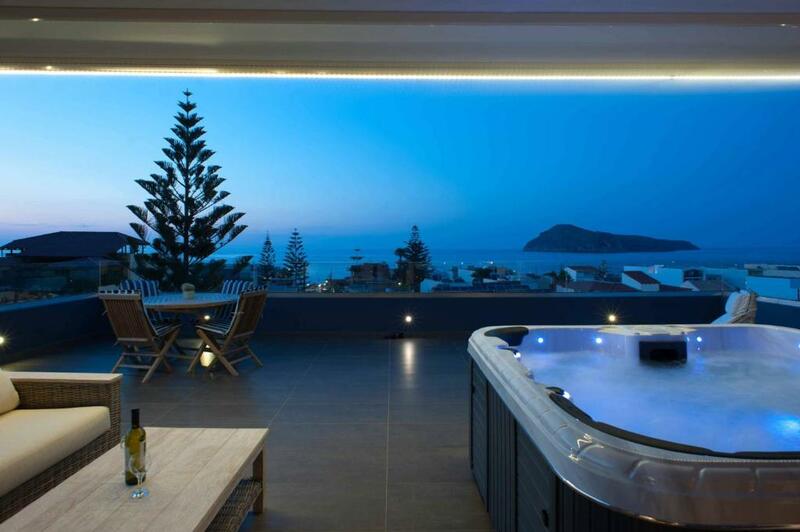 뀐 Located in the top-rated area in Platanias, this property has an excellent location score of 9.3! When would you like to stay at Frideriki Studios & Apartments? Rooms with 2 beds and 2 sofa beds. Rates based on 3 adults and one child (0-6 years old) sharing. 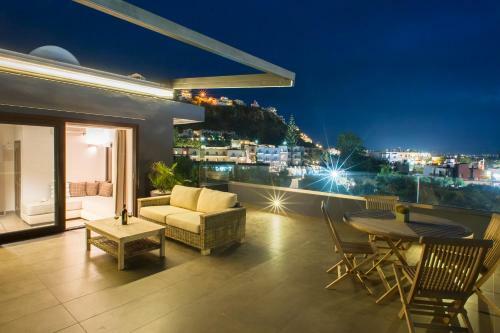 Features kitchenette and either a balcony or terrace with sea or village views. Opening to a spacious balcony with panoramic sea views, this air-conditioned room includes a TV, safe and a bathroom with a bath and hairdryer. House Rules Frideriki Studios & Apartments takes special requests – add in the next step! Frideriki Studios &amp; Apartments accepts these cards and reserves the right to temporarily hold an amount prior to arrival. Frideriki Studios & Apartments accepts these cards and reserves the right to temporarily hold an amount prior to arrival. Please note that housekeeping is offered daily except Sundays. Change of linen/towels is done every 3 days. When booking more than 3 rooms, a non refundable 15% deposit will be charged. Please inform Frideriki Studios & Apartments of your expected arrival time in advance. You can use the Special Requests box when booking, or contact the property directly using the contact details in your confirmation. It didn’t have any shampoo. The property was not very clean, even though they cleaned it every day. There was some kinda sweat smell in the bedroom that we couldn’t find out what’s the source. The property is close to a nice sandy beach and in the middle of Platanias, which is full of cafes and restaurants. The jacuzzi and balcony in the junior suit were very cool. George and his mom were very nice. We found the staff were really rude, particularly George the owner. He was very dismissive and unhelpful, and generally very rude and unfriendly towards us. The room was not as described, it was very small and pokey. Comfort was poor - the sheets and towels were changed once in 7 days and the pillows were very hard. There were no shutters on the windows and it was very bright and difficult to sleep and it was very noisy. No tea or coffee facilities or showers gels/shampoos provided. No toilet rolls given in the 7 day stay, had to ask each time we required a new one. Only one key provided which powers the electricity so when you come back after a day out the room is very hot and takes a long time to cool down, the air con is very weak and does not cool the room very well. Compared to the other resorts in the area, this place definitely does not match up. If I had to be picky the tiny balcony facing the road but as we were only here for one night on our way back to the airport it wasn't problem. We booked a studio and got an apartment so we were more than happy. there was nothing we dis liked about this property. Lady at check in (mum of owner) was exceptionally rude. Only changed towels and linens every 3 days. Wants to charge 10euro for extra child even though extra bed is not available. Just for the extra sheets and towel they provide. So for 4 nights, they want 40 euros for sheets that was changed once. Place is more cramped than it appears in photos. Hot water tuns out at a certain time at night (or maybe turned off??) Was rude to tell us we must wash any dishes used. Book somewhere else imo. Small living area. Room smelt strongly of smoke, we're non smokers so we really noticed it. It's up a steep hill, only a little bit but you need to be fit enough to walk up the hill and then up the stairs. It was fine for me but others may find it difficult. Good exercise though. I found it more tricky walking down the hill in heels. The house is not well isolated.....too noisy, I could even heard the toilet flushing of the neighbors and cars from the street. Do not have materials for cooking such as pan. The apartment had a great roof top terrace which was actually bigger than the whole room! The private Jacuzzi was very nice and we used it almost every day. The landlord and his mother where very helpful and the room was cleaned daily. As the city, Platanias, is basically one long street, all facilities are easy to reach by foot. Nevertheless, if you want to go by groceries in a "real" supermarket and not one of the 24/7 overpriced markets, you definitely need a car. Luckily the landlord can provide a entrance card for the parking space of the hotel beside the apartments, so you can park the car a 1-minute walk away from your door. If you ask for extra towels for the beach, the landlords mother happily will provide a space set for you. She also collects some left-behind things from previous customers like beach umbrellas, so you basically can ask for everything and she will happily give it to you free of charge. The view from the apartment is great! No building is blocking your view for the sunrise on the right hand side and the sunset over one of the small islands on the left hand side. 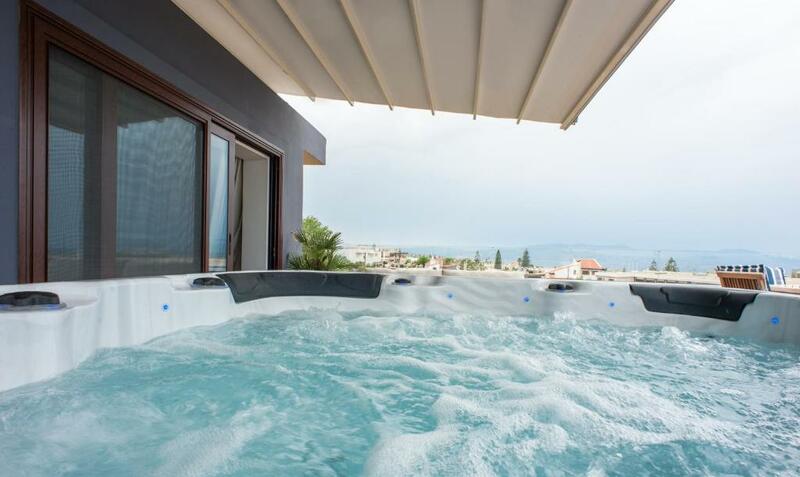 Sitting in the Jacuzzi during sunset is a very nice and special memory we will always keep! We enjoyed this place very much!